New Mera Peak Video Clip: Please click here to view an exciting video interview with Dan Mazur describing his ski descent of Mera Peak. Trip Summary: www.ClimbBaruntse.com : The October - November period features the year's best weather and climbing conditions, and this season was no exception. After a gorgeous trek through the remote Hingku valley, 8 of our team members and 6 top-notch climbing sherpas reached the summit of Baruntse, Nepal's most climbable 7000 metre/23,000 foot high peak with something for everyone, from the beginner to the expert. This was our 3rd successful Baruntse expedition and our expert leader Arnold, who had climbed Baruntse before, and our very strong team of Sherpas, knew how to get our goals accomplished, fix the ropes, manage the porters, how to watch the weather, when to cross the passes, etcetera. Before climbing Baruntse, our team walked to the top of Mera Peak, the finest "trekking peak" in Nepal with the most stunning views of Everest I have ever seen. Mera Peak is 6500 metres/21,000 feet high. After climbing Baruntse, we crossed the incredible Amphu Labtsa pass at 5700 metres/18700 feet high and entered the Khumbu valley at the base of mighty Mount Everest. We congratulate everyone on their great effort. The final climb to the summit of Baruntse is all done on a snowy ridge. The climbing/walking is not technical, however, the ridge is exposed, and ropes are normally fixed. There is a snow path along the ridge. In a few places there are small 3 metre/10 foot high steep sections that have to be navigated. It is often windy on the upper parts of Baruntse. It is important to have good warm Himalayan clothing and proper boots. 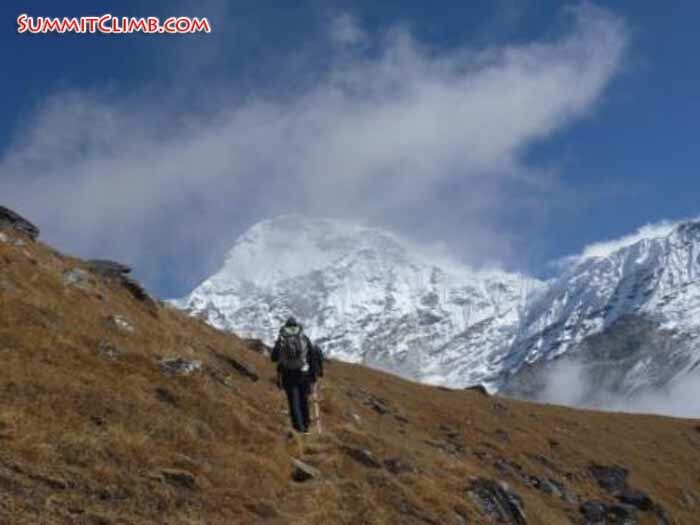 Also, walking to the top of Mera Peak is a very good way to test yourself at high altitude and prepare for Baruntse. The unique thing about our expedition is that it offers two peaks, a high pass crossing, and a grand circuit of the Everest region, all for one low price. Throughout the expedition, we had comfortable tents, delicious food, and good equipment. 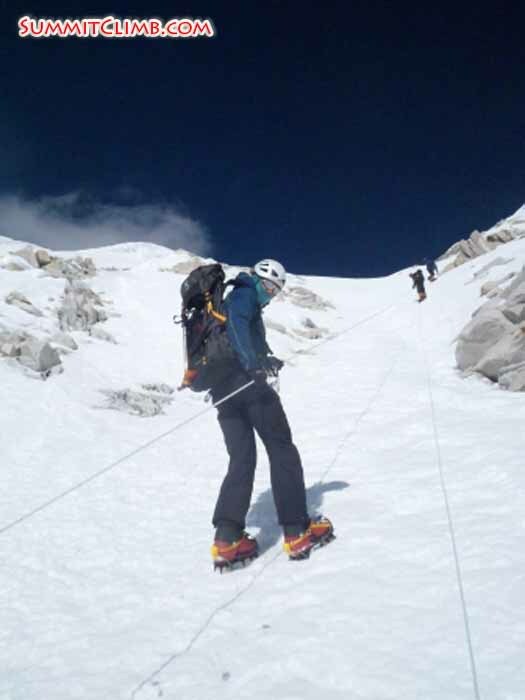 Climbing Baruntse is a fine way to get qualified for climbing Everest, Cho Oyu, Lhotse, and Shishapangma. We invite you to join us for our next Baruntse Mera expedition! Hi everybody, this is Mikko writing dispatch from Namche Bazaar. Our trip is nearing its end, but in an unimaginable way the the trip only seems to get better. The views are great, the mood is great and it is much warmer as we continuously wander ever more towards sea level. Even though we still are more than two miles above sea level the surrounding environment is getting more lush and more green. Yesterday we left Pangboche for Namche and all the sights in between. The skies were clear and for a change we could see some surroundings and the famous 6000+ meter peaks all around. To the North you could see Everest, Lhotse and Nuptse and just opposite across the river you have Ama Dablam lurking ominously as ever. On the way it was hard to walk more than 200 meters before you had to stop and just look at the scenery around you. Just amazing I have to say. Half way through the walk we hit Tengboche and most people did visit the famous monastery that lies there. It is perhaps not the largest nor the grandest Buddhist monastery out there, but the surroundings are hard to match by any other. Despite the monastery, more attention was paid to the much advertized (by Arnold) bakery on top of the Tengboche hill. If you ever crave for sweets like chocolate cake, croissants, mud cake or just a good brew of coffee while walking, this is the place for you. Just imagine the taste of sticky chocolate in your mouth after three weeks of trekking and it will blow your mind. Do not miss this place if you ever come near this part of the world. Tengboche is situated on a hill side of the river and you have to walk quite a bit of uphill to reach it, but it will be worth it. After we had finished the sweets the route did dip down to the river for the last time of the day. The descent was deep and long, but on the bottom there were waiting perhaps the best pertches. Do have your go with chhang, the local brew made either from millet or rice as this was the case now. With the sun shining and the white tipped mountains all around you hardly can ask for more. Not all stopped there though, but continued the yet another ascend towards Namche. The route just North to Namche Bazaar is quite taxing allthough it is quit level. What does take your spirit away is the multitude of bends you have and evertime you think Namche is just around the corner, there is a new bend or two to cross. At least it was moderalety level and the road was almost as wide to drive a car on it. Just before dinner everybody arrived to Namche and our logde, even though some had already spent several hours of taking in Namche's bakeries and coffee shops to get the few breaths of civilization. More than half of us decided to find lodgings with some more features than damp walls of the tents. I can not begrudge them of doing so, as three weeks in a row with the tents can be trying. No matter where people were lodging, all gathered to a bar. We also met some of the Ama Dablam team here who had been stuck in these premises for five days as the Lulka flights have been delayed. What a fun night we had. We are now in the knowledge that we will fly out from Lukla day after tomorrow as the crowd gets cleared out. Today it will be a light walk to a village called Tok Tok and a bit more closer to the grand world out there. Hopefully in two days we'll be back in the fuzz and buzz and Kathmandu. The three of us Mia, Noora and Jangbu left camp 2 at one in the morning. The night was clear. We enjoyed the variable climb. Jangbu had made excellent work finding the safest way through the crevasses, overhangs and icefalls. It was a long night but morning broke as we reached the south summit. From there it was still about 90 minutes until the real summit pyramid. At 8.20 we had a beautiful view of most the 8000er peaks in Nepal and Tibet. It was a windy morning so we didn't stay at the summit to long. On the way down we met Stef at the south summit followed by Tak, Dave, Arnold, Daniel and Steve. It was a really hot afternoon and the two of us had plenty of time to descend to base camp. There we received a warm welcome by the others who summited one day earlier. Stef, Dave, Arnold and Nawang Sherpa summited later the same day. They stayed at camp two and just arrived here in the base camp. The whole team is now back in base camp eating and resting. 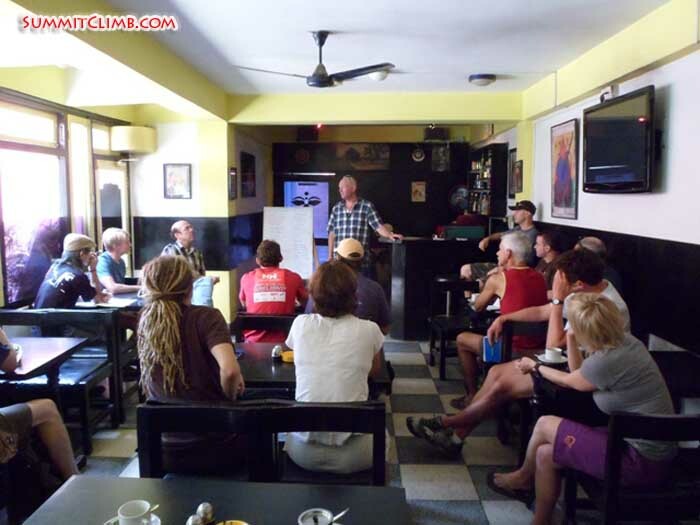 Tomorrow we continue our trip to Amphu laptsa so we still have some climbing ahead. It has been a long trip and we are all looking forward to the treats in Namche. Summit Ridge of Baruntse (Arnold Coster). 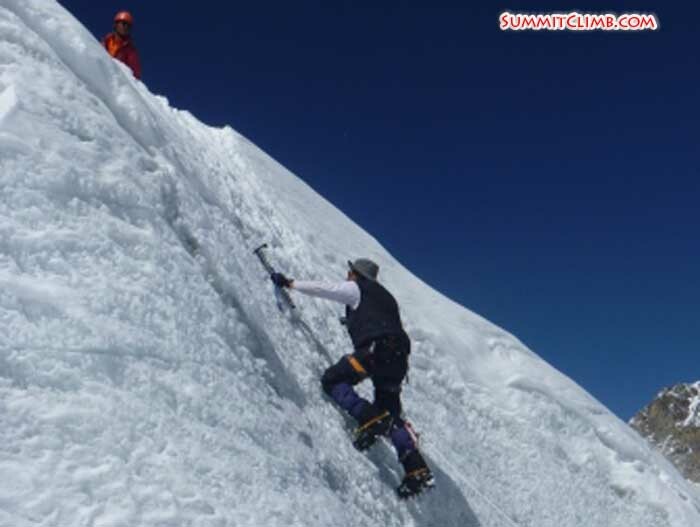 Already one day before the official summit day 5 climbers reached the summit of Baruntse. Whereas the main part of the expedition moved from camp I to camp II, the climbers pursued the so called "swiss solution": They started early form camp I and skipped camp II. So they avoided a second night high on the mountain and the foreseeable "traffic jam" at the official summit day. Chief-Sherpa Jangbu, assistant Sherpa Chauwang, Rich (UK), Jan (Holland) and Markus (Switzerland) left Camp I at 2 AM they reached the point where the ridge gets very sharp (approx 6800m). At this point all groups of other expeditions this season gave up and turned back from here. Luckily our Sherpas found a route from here the day before. The sharp ridge provides an excellent ice climbing over several steep ice walls and extremely exposed cornices. 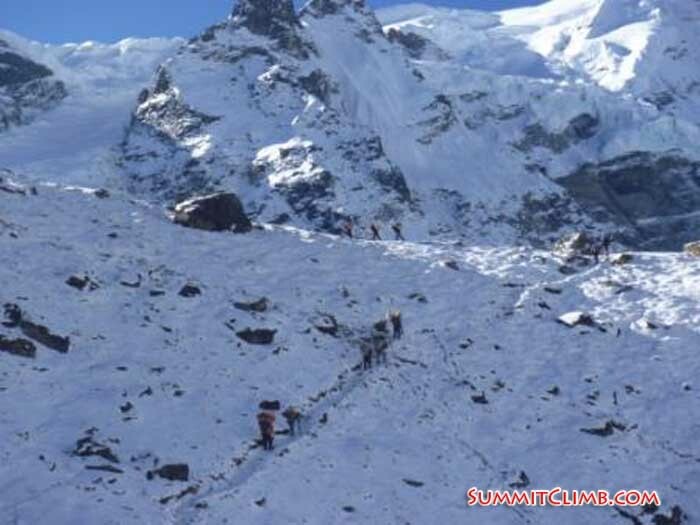 At 10.45 the two Sherpas and the three members reached the summit. During 30 Minutes they enjoyed the spectacular view. 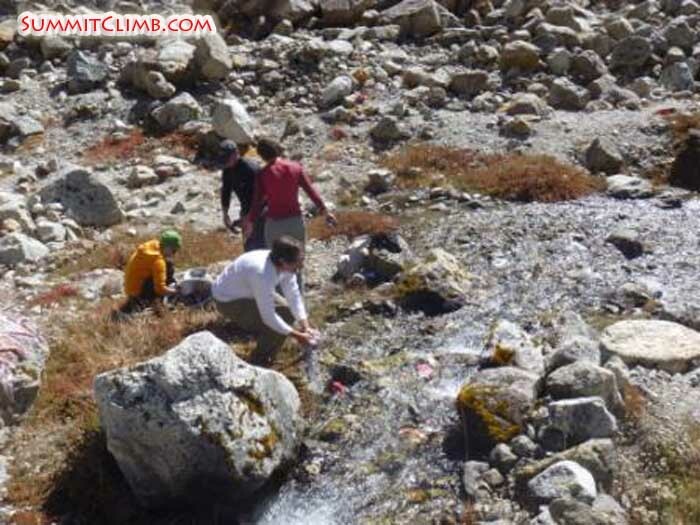 Update: Team 2 Summits Baruntse! Walking to Baruntse high camp (Arnold Coster). 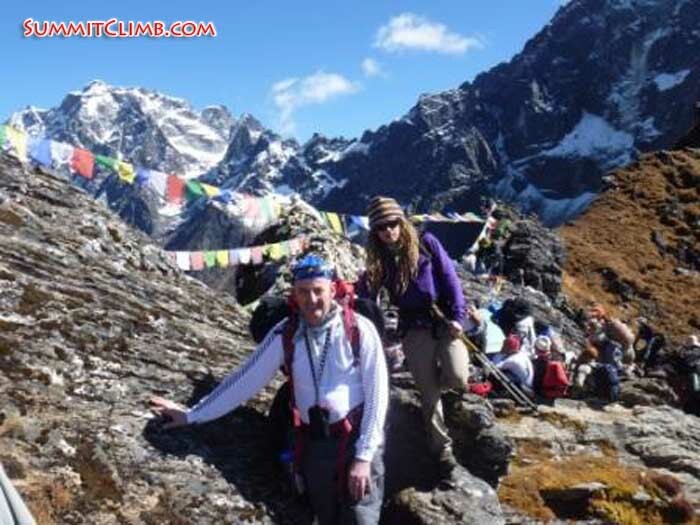 Update: Team 1 Summits Baruntse! 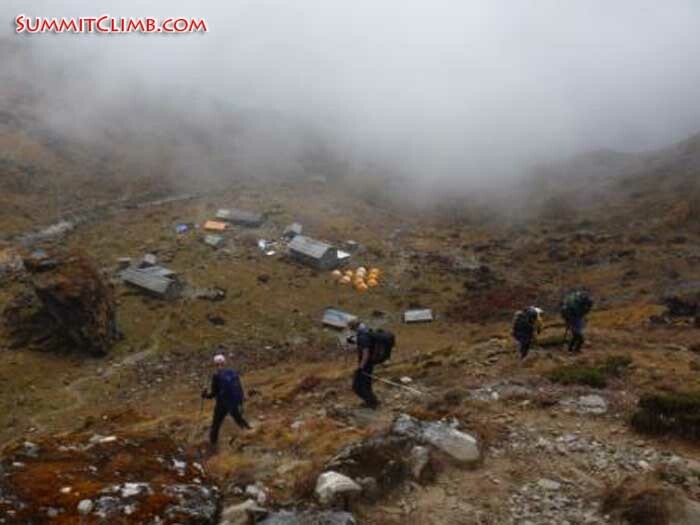 The trek in to Baruntse basecamp (Arnold Coster). Today we set off for our summit push. Unfortunately Alan, Erich and Mikko decided not to join us. 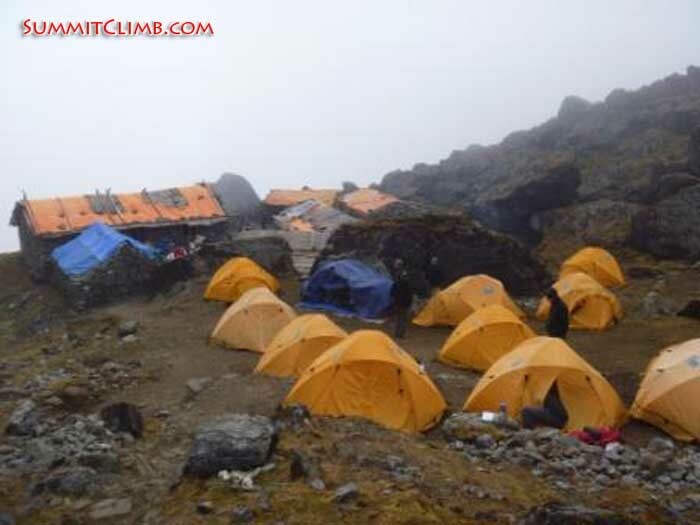 I am in Camp 1 at 6100m now with 13 members. Tonight our first group, Jan, Markus and Richard, will set off at about 2am. They will try to summit direct from Camp 1, all the others will climb to camp 2 tomorrow at 6400m and try to summit the following morning. So far none of the other teams here reached the summit off Baruntse. 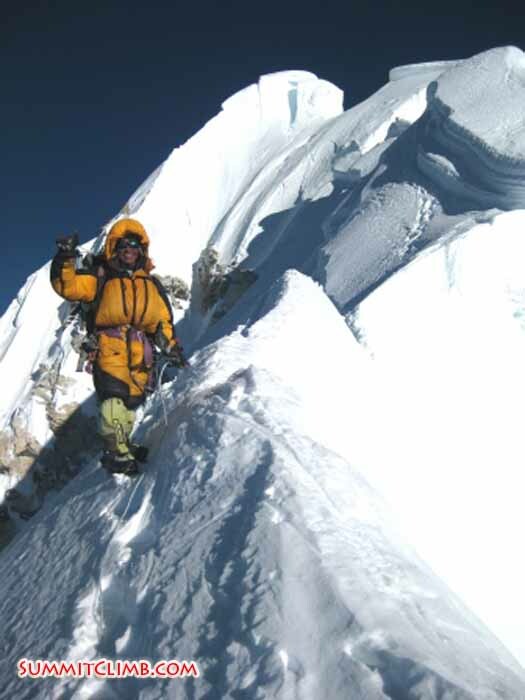 Yesterday our super Sherpa, Jangbu already went up and fixed rope on all the main difficulties of the summit ridge. They returned just a few metres short of the summit, leaving the last part for us to conquer! So all is well, I hope the weather will stay as good as it is now. Actually it's warmer here in camp 1 then it was is base camp. I will call in dispatches from Camp 2, so stay tuned! Sunset on Baruntse (STef Wolput). After almost everyone of our group, including me, summited the 6476 m high Mera Peak North, our trek continued to the Baruntse base camp in the shadow of the mighty Baruntse. After a well deserved rest day we held a Puja ceremony during which we and our climbing gear were blessed and we asked the Gods for a successful and uneventful climb. All we did so far was preparation for our Baruntse climb where we got a first go of it yesterday. 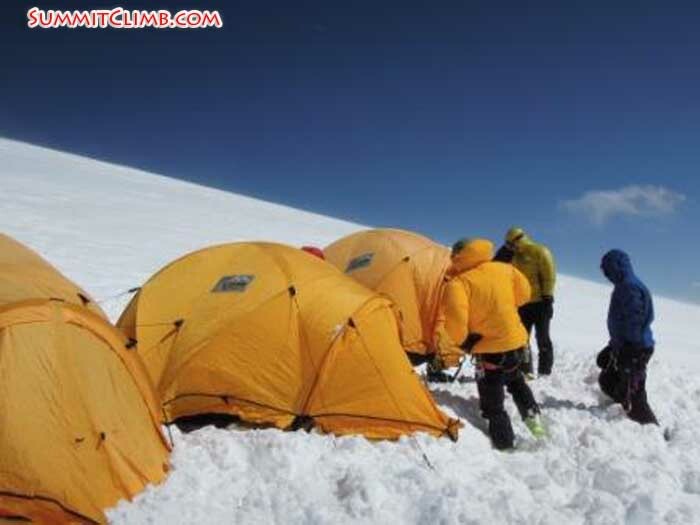 Most of the team did a carry from basecamp at 5300 metres to camp 1 at 6100 metres. Most of the climb consists of a moderate climb with some steeper sections. Only the last part is more difficult, where we had to negotiate the couloir to the west col, a 45 degrees 200 metre high ice wall. It was a nice climb with beautiful views on the surrounding mountains: Ama Dablam, Baruntse, Makalu and the Amphu Lambtsa La which we will have the cross in a few days time. Plans for the next days depend on a couple of parameters like weather and route fixing. Today we are having another well deserved rest day and if everything goes as planned then tomorrow 31 Oct we will move to camp 1, 1 Nov camp 2, 2 Nov summit push, 3 Nov back in basecamp. Everyone is doing fine with the altitude. We are now at a stage where our bodies are rapidly adapting to the altitude. To all loved ones, family and friends; I'm doing extremely well, no complaints and I'm hoping to stand on the summit of Baruntse in a few days. The couloir to camp 1 on Baruntse (Arnold Coster). We arrived yesterday at Baruntse Base Camp. After dipping briefly into a valley, we spent the day moving up and across lunar landscapes until we came to our camp site. Situated at over 5400m, we are hemmed in on all sides by jagged black rock, ice and snow. Overnight temperatures touched -20 C, with strong winds amplifying this still further. This is an impressive natural environment: utterly desolate and utterly magnificent in its desolation. Today was a rest day, before we begin moving up the mountain tomorrow. 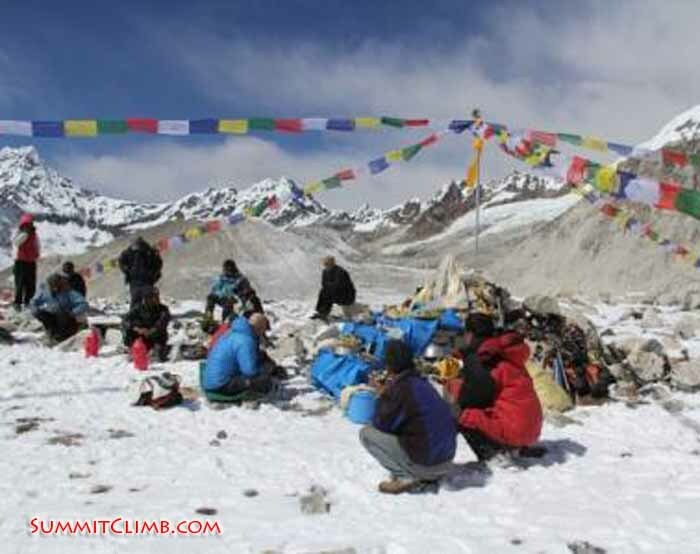 We will be depositing gear and provisions at Camp 1, around 6100m. The Sherpa held a Puja ceremony this morning, which is customary before beginning a climb. 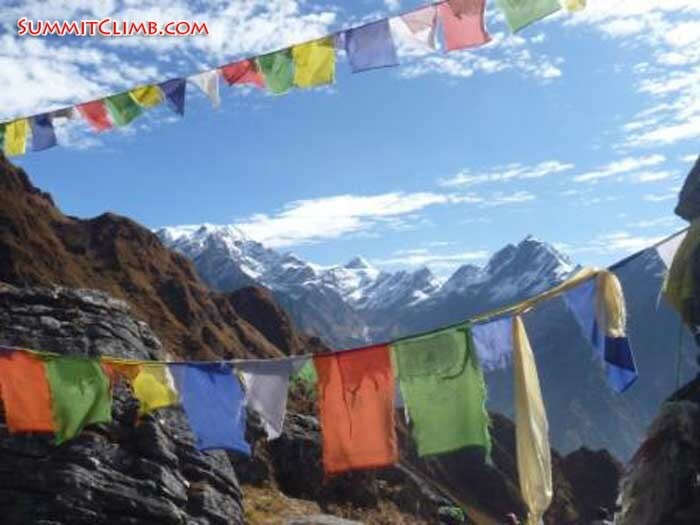 Many of the western climbers participated, placing an object to be used in the climb - ice axe, crampons, boots - on an altar that was made from stones and adorned with Tibetan Buddhist prayer flags. The ceremony was concluded with readings and ritual blessings. Radiation from the morning sun warmed things up a bit and some were even seen removing their heaviest down clothing. This afternoon we are just relaxing, drinking tea and preparing for tomorrow...it's time to leave our capsules if we dare. Puja ceremony in Baruntse basecamp (Arnold Coster). After the hard efforts of summit day, we were all delighted to hear that it was back to the normal routine this morning - a friendly wake up with a cup of tea at the leisurely hour of 7am! On the bright side, given that an early night had been the order of the day the evening before, this still meant at least 10 hours sleep, something of a luxury after our rather short night at high camp. In truth however, I was woken somewhat earlier by a new dawn chorus - the sound of hacking coughs coming from other tents, and also somewhat closer to home from my tent-mate Steve. 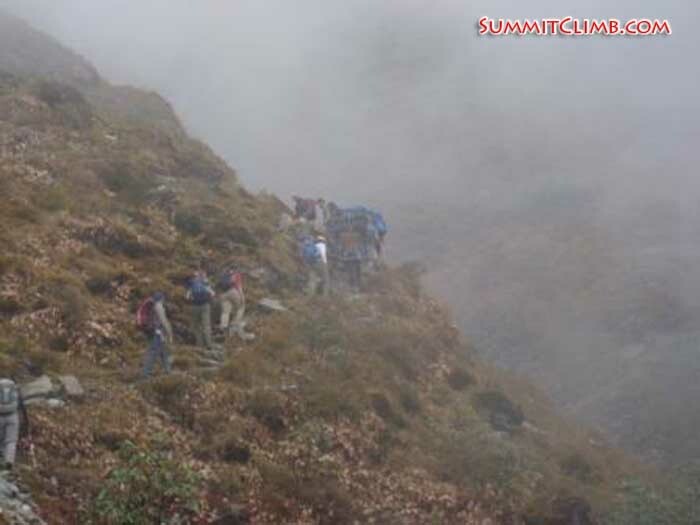 The famous Khumbu cough seems to have taken a hold on a number of team members after the strain of climbing Mera. Still, today was to be a nice relaxing day - a 500m decent down into the Hongu valley where, we were assured, the air would be rich with oxygen, the weather would be warm and sunny and we could all expect to sleep well. With these bright thoughts, I got up for breakfast, only to discover that it was cold and windy and, even worse, the porters had already taken down the dining tent ready to leave. Breakfast was therefore to be an alfresco affair - although it was lovely sitting with views of Mera peak, eating porridge and then omelette and chapattis with gloves on proved slightly more difficult than our normal breakfast (its worth noting for any concerned mothers out there that we are eating extremely well on this trip!). Breakfast over, we set out with various layers of down clothing on, looking generally more like we were heading out for the summit again than going for a short trek to our campsite. To compound the disappointment of the cold weather, in what is becoming something of a pattern, the walk downhill turned out to be typical 'Nepali' down - with more time spent going uphill than going downhill! Fortunately, we were quickly rewarded with some stunning views of our main objective - Baruntse - glistening in the sunshine at the end of the valley. The walk therefore turned into quite a relaxed affair, a gentle pace for our tired muscles and lots of time to take photos along the way as we passed some stunning green lakes on the way down. Tents in Baruntse basecamp (STef Wolput). 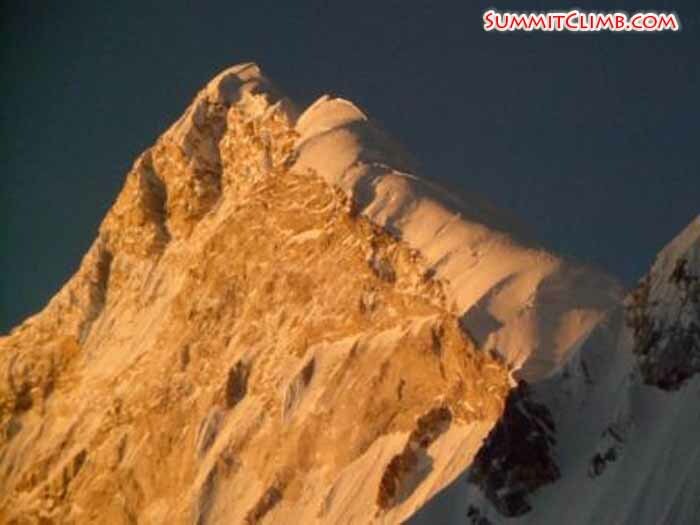 17 members and staff reached the summit of Mera Peak! This morning (night) our staff woke us at 12am with tea and porridge. We all left high camp at 2 o'clock. The weather was calm and surprisingly warm. Only close to the summit we encountered some winds. Everbody managed to summit between 6 and 8 in the morning. Read below what Vivian and Jan have to say about their summit push. 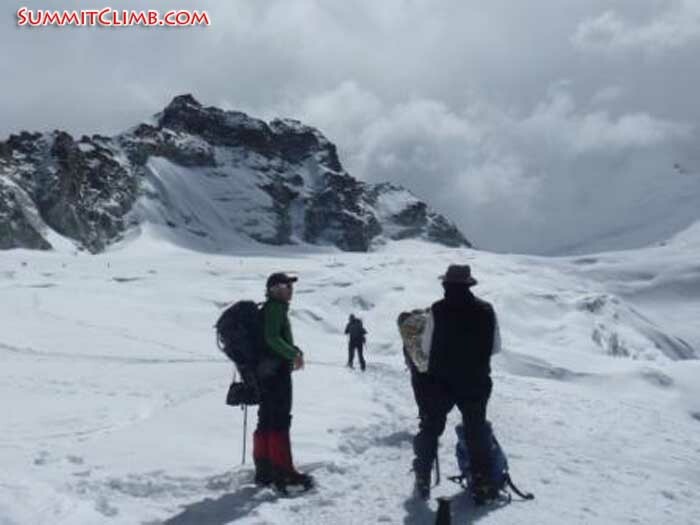 Team members heading up to the high camp (Arnold Coster). Mera Peak. Around 6500 metres above sea level and incredibly cold. We trekked up to high camp on Mera yesterday and today was our first summit attempt of the trip. We were woken at midnight (!!) to prepare for our bid for the top. I managed to whimper "coffee" and, courtesy of our fantastic team of Sherpas, my request was granted. We set out into the freezing pitch black, the glow of our head torches a poor match for the impenetrable darkness. I felt completely disorientated as I followed the head lamp in front of me, hoping that it was going in roughly the right direction. After about an hour, I turned to my husband and whispered "I don't mean to alarm you, but I think that we may be at the front". A brief bout of questioning revealed that yes, we were indeed embedded in the lead bunch with the assistant guide and three climbing Sherpas. The arrival of Switzerland's Marcus and fellow Brit Rich (normal habitat, Somewhere Near The Front) convinced us that we had accidentally entangled ourselves with the A Team, so we dropped surreptitiously back, knowing that we would not be able to keep up their pace. It transpired that this was a bad time to be on our own, as a howling wind struck up, blowing snow into our faces and, more pertinently, covering the footprints of the group ahead. By this time we had been joined by Mia from Finland and the three of us battled into the snow and wind, in the direction we'd last seen any semblance of head torch. I was starting to get cold and even the sun, rising rather spectacularly over the stunning backdrop of the surrounding Himalayan peaks, did not alleviate this. Mia moved on ahead and we were joined by team guide Arnold. 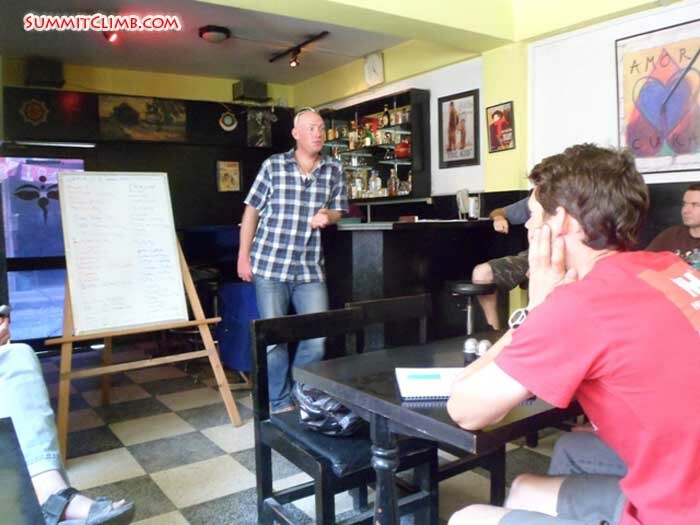 He pointed out Everest, Lhotse, Kanchenjunga, Makalu and Cho Oyu to an enthralled Husband. Five of the world's 14 highest mountains towered over us, it was a spellbinding sight and went some way to consoling me for the fact that I could not feel my fingers. At about 6.30am we arrived just below the summit of Mera. There, I was confronted by a near vertical ice wall and expected to climb it. I did a quick analysis of the situation. 1: I had been up since midnight. 2: I was substantially higher than any mountain in Europe. 3: I couldn't feel my fingers. And crucially, 4: I was now supposed to negotiate a precipitous massif of ice. I won't lie. A small part of me thought "well.... heck, I'm nearly there..... I don't really have to climb up this." Sadly, The Husband and Rich decided that now would be an opportune moment to inflict some more suffering on me and proceeded to issue a series of conflicting commands from the foot of the ice wall. I started to scramble up the block of ice, pausing at times to hang off my ice axe, gasp for air and contemplate mountain etiquette with regard to falling asleep whilst roped onto a wall of ice. Eventually I arrived at the top and collapsed gracefully at the feet of Mia and Noora, also flying the flag for Finland. Yesterday all members and most sherpa's walked in their own pace to the Mera Peak High Camp, over the snow fields and glacier. The location of this camp is such, that you should not sleepwalk out of your tent. The tents are placed on small ledges, mostly on a different level. Also finding a 'toilet' place might be very risky, on some rock sticking out. But this, I guess, is one of the adventurous things we booked for. As Arnold remarked, Mera Peak is of course lower than the big giants of 8000+ m, but it has a lot of the things you will find there. So an excellent training mountain for Baruntse that we will reach within a week. Late in the afternoon our really great cook staff made a dinner, served in the tents. We tried to get some sleep till wake-up time, 0.00 h. A breakfast was served, and everyone except Erich prepared for the climb. At 1.45 all climbers and climbing sherpa's were ready and we left. Soon the group was split up into smaller groups (there's a variation in climbing speed), all led by a sherpa. As I later heard most of us had a hard time climbing the 800 metres from high camp to the summit. Was it the early time, or the wind that blew snow in our faces? Apart from Andrea (cold feet) everyone reached the summit, after the last 10 m of iceclimbing with a fixed rope. The first group (Richard, Markus and me) had at 5.30 a.m. an astonishing view on the surrounding mountains and a beautiful sunrise. At about 8.30 all members had reached the summit. It was hard work but worth while! 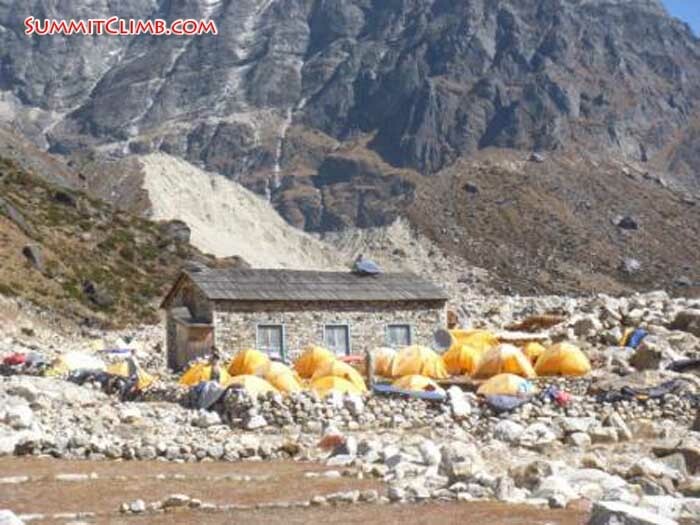 After taking their belongings from high camp all climbers are now back in base camp. Tomorrow we will leave this camp in the direction of Baruntse base camp, which we hope to reach within two days. Setting up camp 3 (Arnold Coster). This morning the sunshine on my tent woke me up! Our Mera peak base camp is really at a good spot.Nobody here, only us! After breakfast we left for the glacier nearby to do some rope training. Our Sherpa's went ahead already to fix some lines. It's a nice little ice cirque with for ropes. We practiced some cramponing, jumaring, rappelling etc. For the first day we had a full day off sunshine, although it looks windy up high. 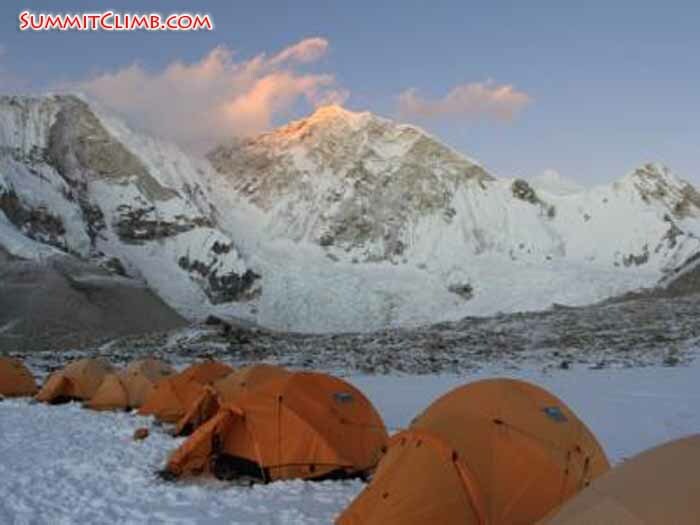 Tomorrow we will climb to Mera high camp at around 5750m and try to summit Mera the next day. I will be calling in voice dispatches with our progress. 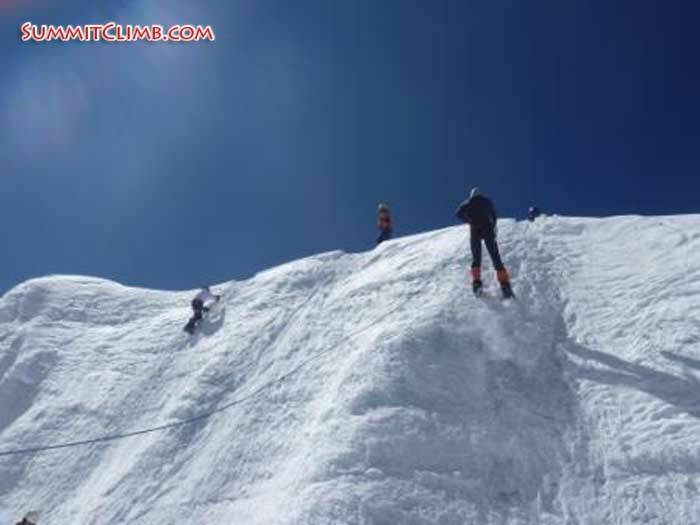 Rope training on Mera Peak (Arnold Coster). After a snowy day yesterday, today stated off sunny and nice. Although the trail was covered with a couple of centimetres of fresh snow, walking wasn't too difficult. The route follows the glacier moraine until you hit the snow cover on the pass. From here you have to climb a little steeper on top of the snowpack, but once you're on top, the route is kind off straight and flat until the pass drops down again. The surroundings are beautiful; it's a playing arena for mountaineers! We also get a good view on our route on Mera Peak. Unfortunately the day ended with snow again, this is quite normal in the afternoon. The clouds always drop down and give a little precipitation, but not too much. We passed the last villages until after Baruntse. We have our own kitchen setup, dinning, shower tent, toilet etc. totally self supported from now on! Tomorrow we will do a day of rope training, before we go higher on the mountain. Probably later in the afternoon some washing and I might shave. Crossing the Mera La (Arnold Coster). Today we woke up with a fresh amount off snow, all night it had been snowing and it didn't look like if it would stop soon. So I decided to stay in Khare and not cross the Mera La today. Specially for our porters who don't have the same equipment as us this would be a bit risky! 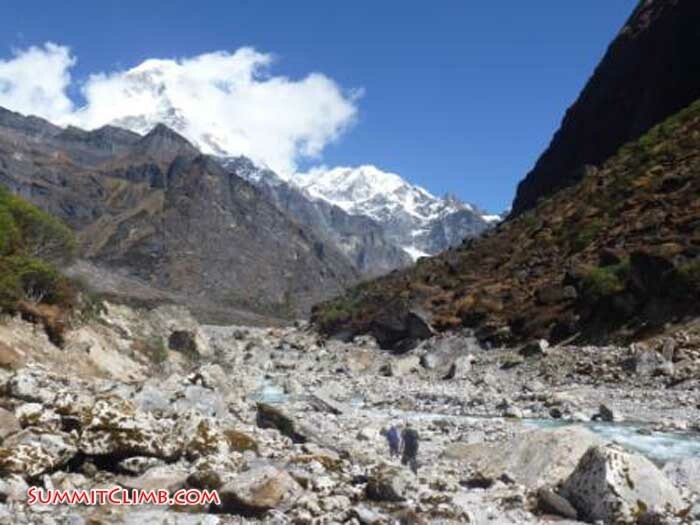 Now it looks like the weather is clearing, so tomorrow will probably be fine and we will cross the Mera La to our basecamp at the other side. Hi everyone. This is Tak. Greeting from the high Himalayan mountains just below the Mera La 4900m. Today we are not going to go anywhere because of snow. Anyway so far so good. I feel fine, eat well and drink well. I cannot go first because high altitude makes one go slow, step by step. Mizuho san please let every one know I am ok.
Good afternoon to those of you unfortunate enough to know me.... Viv here. Today started with our morning wake up call with a Sherpa delivering us coffee in bed (or rather in sleeping bag and tent). We set off at an enthusiastic 8 am for our highest camp to date, Khare, which nestles at the foot of Mera Peak at a respectable 4900 metres. The terrain was more gentle than on previous days and a gradual incline saw us gain 700 metres over the course of between 2 and 3.5 hours. We saw more of Mera Peak today than we have before as we moved steadily towards the north side, from where we will start our ascent. The mountain afforded us some spectacular views, with the snow drenched peaks rearing through the clouds to tower above us. As we started to pass glacial moraines and vast ice seracs, there was no mistaking the fact that we were now truly in the mountains; the sub tropical vegetation and verdant valleys of past days were far behind us. On arrival at Khare we were greeted, as always, by Sherpas bearing warm lemon juice and a welcoming smile. Khare boasts a handful of tea houses, an abundance of two man orange tents and several makeshift "facilities". In comparison to some of our previous camps, it's a veritable metropolis. Lunch was served in a bona fide building - it had windows, stairs and, if you will, floorboards. From this lap of luxury, we will venture forth tomorrow to attempt the Mera-La pass. This snow-covered corridor will perhaps be the group's greatest challenge to date. At 5600 metres, it will be the highest point that some of the group have ever reached. 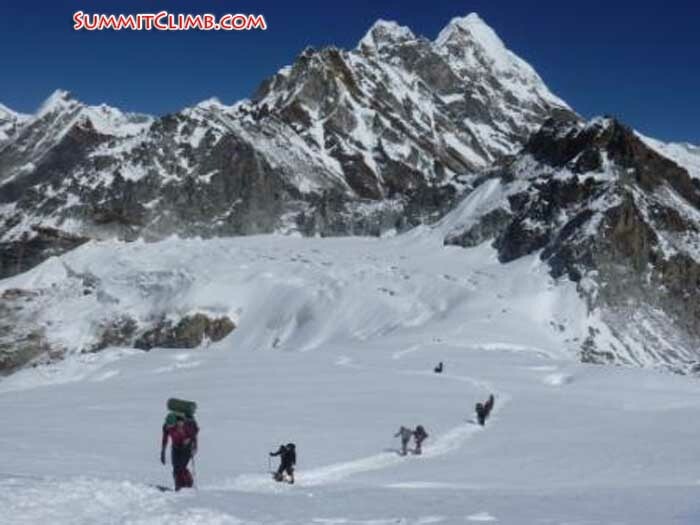 Our crampons and ice axes will be unearthed for the first time as the pass presents us with technical challenges and leads us, as we descend, to Mera Peak base camp. Team resting by a stream in Thagnag and doing laundry (Arnold Coster). After a good night of sleep, this morning was a waiting game for the sun. It looked like the sun was playing games with us: everywhere in the valley we could see sunrays, but at our camping spot it seemed a lot longer before it appeared. At around 9am we got rewarded for our patience and we could fully enjoy the warm sunrays. We spend the morning washing clothes, shower and shaving (for the guys). Some off us went for a small acclimatization hike to a view point nearby. Our comfortable camp in Thagnag (Arnold Coster). As usual, this morning we were woken up by the sherpas serving morning tea. You can hear the sound of the tray with mugs from far away. It's one of the finest moments of the day. Also as usual it was very nice weather in the morning. Yesterday we had to climb a 'little more' than expected (optimist Arnold called it 'only going down'). We were anxious to experience today's trip from 3500 to 4200m. This time it was not quite as easy, but we had a nice path, gradually ascending along a river with great views. Today and the following days we will make a half turn around Mera Peak before we sprint up to the summit. Within an hour from the first of our group arriving at Tagnag, everyone was here. We had a rest in the sun, which really felt like we were in some summer resort. We are going to stay here for two nights. Tomorrow we will be acclimatizing, resting, washing, showering - just as one wishes. Beside that we're a quite a strong group right now and also a group of people that creates a good atmosphere, with animated talks during all meals, from breakfast to dinner. Mostly English is the common language, but sometimes you can hear Finnish, German or Dutch too. It's a good life here in the mountains. This evening we are even sitting around a warm wood stove! So bye-bye for now from this holiday resort. On the way to Tagnag (Arnold Coster). After another early start we hiked to Kote. In the beginning the rout zig zags along the hillside from Zetra, before it drops down to the forest. Before dropping down we got our first view of our objective, Mera Peak. Although this peak is known as a 'trekking peak' it's a massif giant at the end of the Hinku valley. The forests first consists of rhododendron and bamboo trees, but later giant ancient pine trees. The path continues down until reaching the Hinku River. Along side the river is the small village of Kote, a small oasis! Here we also resupply the expedition with fresh vegetables and meats. Tomorrow we will continue to Tagnag at around 4300 metres. The beautiful hike to Kote (Arnold Coster). In the night Charkateng cleared up and we got treated with clear views in the morning. Our staff woke us up at 6:30 am with tea and coffee. We packed our duffles and as soon as our porters got a hold off these, they were already on their way! These people are amazing carrying 30-50kg on their backs, very essential for a successful expedition. Today we had a clear view of our caravan of porters, because the route goes straight up the Zetra La. I think the group is strong; we all made it up to the pass in a few hours. We had great views of Cho Oyu, the mountain we summitted with our other expedition team just 13 day before. After a small lunch break we descended down to the small settlement of Zetra where we will spend the night. Tomorrow we will descend to Kote and we are really in the Hinku valley. The Hinku valley is green and beautiful, I am looking forward to that. Crossing the Zetra La (Arnold Coster). Last night we had our first night in tents, from now on these will be our homes. After a good breakfast we headed up to Charkateng just a few hours walk. The trail goes up fairly steep and we walked in the clouds most off the time. Charkateng is located at around 4000m, just before the Zetra La pass. Tomorrow we will cross the pass and walk into a new valley until we reach Mera Peak. It was just a short walk today, so I don't have much news. We are having an easy start, so we can save energy for later! Arriving through the mist to Charkateng (Arnold Coster). This morning it was an early and slow start. We left our hotel around 5:30 am to go to the airport for our Lukla flight. Lukla is a small, but busy mountain village at the Everest trail. Many tourists start their mountain adventures here. It has a tiny airstrip on the hillside and the flight specially the landing can be very exciting. The problem is that they only fly when there is good visibility. This morning started off foggy, so we had to wait a couple off hour's at the Kathmandu airport before we finally could fly to Lukla. After this everything when smooth. Kaji our Sirdar, already arranged the porters we need for our trek. We had lunch and moved on to our first camping place just below Chutanga at around 3200m a couple of hours walking from Lukla. Here we pitched our tents and have our first night out in the mountain. Tomorrow we will move on to Yak Kaharka at 4000m, this way we can split the altitude jump over the Zetra la pass in two. All members are fine and healthy; we are all eager to go to higher elevation. Our cozy camp in Charkateng (Arnold Coster). Team meeting and orientation (Stef Wolput).